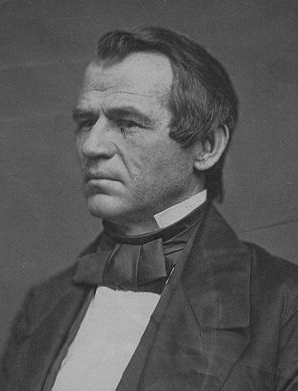 Andrew Johnson (December 29, 1808 – July 31, 1875) was the 16th Vice-President and 17th President of the United States. Johnson was born in Raleigh, North Carolina in 1808. He was apprenticed as a tailor. Before becoming Vice-President, he was a Governor and U.S. Senator from Tennessee. When Tennessee and ten other Southern slave states declared they were no longer part of the United States, he was the only member from such a state to not quit his seat in the U.S. Congress. A southern Democrat, he was elected as Abraham Lincoln's vice-president on a "National Union" ticket in 1864. He became president in 1865 after Abraham Lincoln was killed. Congress was then run by Republicans, and after Lincoln's assassination, they wanted stricter terms than Johnson did for the Reconstruction of the Southern states that had rebelled. As a result, he vetoed 29 bills passed by Congress, and is the president to have the most vetoes overridden (15) by Congress. He was also the first President to be impeached, but was later acquitted by one vote, and finished the rest of his term. The only U.S. president never to have gone to school, he was later taught to read by his wife, Eliza McCardle Johnson. The U.S. purchased Alaska from Russia for $7.2 million (the price was 2 cents per acre) while he was president. Andrew Johnson Facts for Kids. Kiddle Encyclopedia.